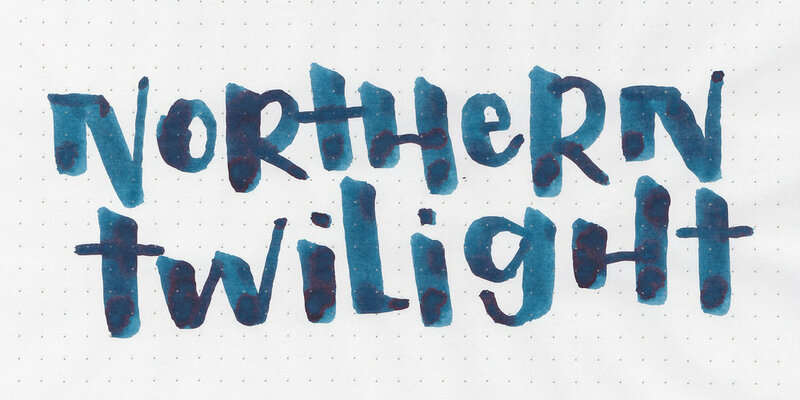 In 2016 KWZ released Northern Twilight at the Scriptus Pen Show. The release was limited to 244 bottles. Since the ink was so popular, KWZ re-released the ink at the 2018 Scriptus Pen Show, again as a limited release. I was able to snag a sample of the 2018 release from a pen friend. Let’s take a look! Northern Twilight is a dark blue with just a hint of green. In large swabs you can see the black sheen. In large swabs the ink takes a very long time to dry. The ink drops below are still wet after a few days of drying. Feathering: Low-the ink did have some feathering on Rhodia in most nib sizes. Other properties: low shading, medium sheen, and no shimmer. On Staples 24 lb copy paper there was feathering and bleeding in all nib sizes, so it’s not an ink I would recommend for cheap paper. I did not see any sheen on this cheap paper. Northern Twilight is closest to Robert Oster Great Southern Ocean. KWZ Meet Me In St Louis is the closest KWZ ink I have to Northern Twilight, but it has a lot more green in it. 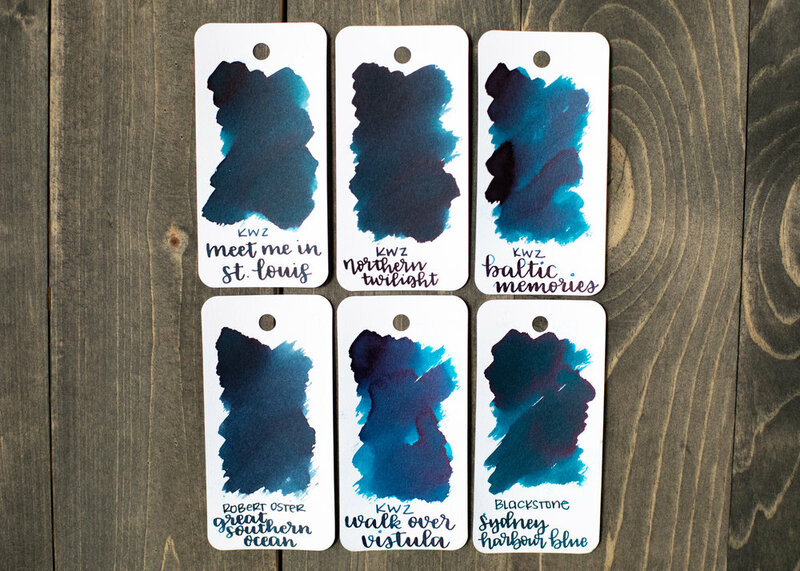 Click here to see the KWZ inks together, and click here to see the blue inks together. I used a Pelikan M605 White Transparent with a medium nib on Tomoe River paper. The ink has a wetter than average flow. Overall, I really like this ink. I ended up writing the pen dry while working on letters for InCoWriMo and was sad to see I had used it all. It has a nice flow and lovely dark color. I wish I had a bottle but since it was so limited, the closest ink I can recommend is Robert Oster Great Southern Ocean. Disclaimer: A sample of this ink was donated by a pen friend. All photos and opinions are my own. This page does not contain affiliate links, and this post is not sponsored in any way.